The secret behind any delicious prosciutto, spec and other charcuterie items is passion. 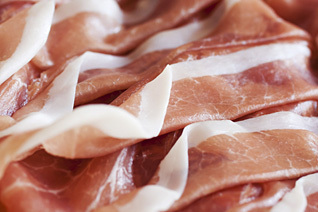 The secret behind any delicious prosciutto, spec and other charcuterie items is passion. The time, patience and special selection of our meats define the passion Atalanta has for this category. Each cut is made from high-quality fresh meat that has been carefully cured using only time honored traditions passed down generation to generation. When selecting one of our high quality meats ensures nothing less than culinary perfection.